to use them can seem a thankless task. Its often pretty dry material and training sessions aren’t usually scheduled to link in with the point at which students immediately need to use the resources. Medical librarians at the Clinical Sciences Library are in the halfway through running some sessions this year which we hope begin to address this problem. We have been experimenting with a new approach to our library training with our first year medics giving them a mindmap of information resources they need for their course. The School of Medicine invited us to get involved in their new ‘clinical problem solving’ module, which aims to get new students making connections between their modules and understanding deeper processes rather than trying to get by learning by rote. The students have to solve problems by making these connections and they are expected to be able to do their own research to before they can work out the answers. Google and Wikipedia alone won’t do this for them. 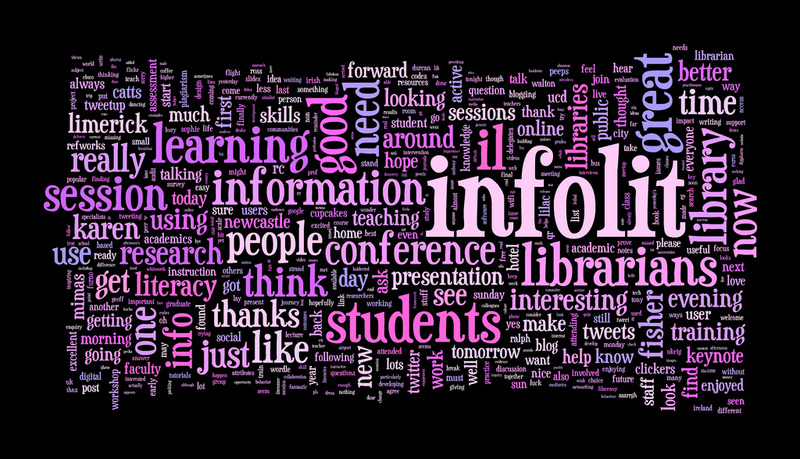 This is where our information literacy training fit in. Previously we have dived straight into Medline to get them conversant with the research literature and how to find it. This time we created a map of information resources. The map links directly out to the resources and is organised to help the students see which places to go for either an overview of a topic or for more detailed information. The resources range from dictionaries and clinical guidelines to statistics and bibliographic databases. It is hoped that the students can return to this map to help them clarify where to look for information at any time within their course. In our training session the students are introduced to the resources on the map by integrating voting questions using Turning Point to ensure they understand them. Later in the session they are given the task to find the answer to a clinical question using two contrasting resources, explaining where they found the information to support their answer and also how they found it. Its early days and when we have finished our sessions we will compile our feedback from the students and the course tutors. We are hopeful that the map has the potential to be developed into a more ambitious elearning tool useful for many different contexts. Yesterday I was a at a well attended and quite sparky EMALink event. EMALink if you didn’t know is the East Midlands Association of Librarians, an informal events programme arranged by the universities within and between the East Midlands HEI universities, including a few unis who are perhaps on the friges of this region (e.g.Warwick). The two chunks yesterday were a framing talk from Joanne Dunham and then a longer talk about her and Alan Cann’s work by Sarah Whittaker. There was also a couple of group work exercises for us to get our teeth into; including planning the ideal information literacy training event’ and reflections on our own Web 2.0 experiences. I wasn’t originally going to go along, thinking that being a bit clued up on Web 2.0, that I wouldn’t be able to take much away from the day (doubtless I’d have much to say as usual, so apologies to anyone who struggled to get a word in edge-ways over me!). Actually I was dead wrong, as there were several brilliant ideas that people in my group talked about that I fully intend to steal…erm, re-purpose! One solid output from the day was the suggestion that we ought to have a directory of sorts for all the Web 2.0 networking librarians in the region. unfortunately once again my loud mouth/native enthusiasm resulted in myself being tasked with the job. Not that I really minded! And so I am proud to roll out the East Midlands Librarians Networking site – a directory for EM librarians to share their social networking IDs (or at least as many as they want to) and to help us forge some strong local routes of communication. The site, such as it is, is here.